Throughout Connecticut you’ll find a variety of delicious cuisine from all over the world. The Indian food, in particular, has quite the presence in the state. It doesn’t matter if you’re craving lamb vindaloo or saag paneer, you’re going to find an authentic and delicious version of it at one of the great Indian restaurants in Connecticut. Here are our favorites. Featuring a contemporary and perhaps elevated Indian menu, the House of Naan gives diners a lesson in Indian flavors incorporated into unexpected dishes. The dinner menu is especially tantalizing, serving malai kofta, chaats, and biryani. Those skeptical of Indian cuisine may want to try their raved about tikka fries and spiced lamb burger. The Mint Leaf offers a wide range of delectable Indian dishes including some that are difficult to find elsewhere in the state. The standout part of the menu has to be the appetizers section, which features an array of delectable snacks such as chaat, pakora, papadum with chutneys, momos, and samosas—and all would be great accompaniments to their full bar and local beer selection. They also serve standard Desi fare, naan, burgers with an Indian flare, and soups. Vedas is a takeaway restaurant offering typical Indian dishes with the aim to provide home cooked and healthy favorites for diners. Appetizers are great for evening get-togethers with friends and include vegetable samosa, Chicken 65, coconut pepper shrimp, and onion bhajia. Main dishes available on the menu are kebabs, meat, fish, and vegetarian entrees, and biryani. Unlike many other Indian restaurants in Connecticut, Vedas also sells homemade chutneys to accompany and order or two of crispy papadum. For a quick lunch, Vedas also offers tiffins packed with your choice of menu options. The Mumbai Times introduces diners to both southern and northern Indian dishes with their extensive lunch and dinner menus. Dine on Goan curry shrimp, chicken saag, or spicy lamb vindaloo for lunch or their even larger dinner menu featuring kababs, organic salmon tikka, spicy kozhi Chettinad. Scoop up all of the flavorful sauces using one of their several naan options. Cormandel is a highly rated Indian restaurant with several locations in western Connecticut. Offering the convenience of ordering online for takeaway, their menu features numerous Indian favorites such as tandoori and entrees with beef, chicken, seafood, and lamb. Vegetarians have no need to worry, as the veggie menu is extensive and features aloo gobi, mutter paneer, sag paneer, and more. When you’re in a rush but still seeking something flavorful, filling, and healthy, Tikkaway is an awesome option. Ordering at Tikkaway is simple, as you can create your own rice bowl, salad bowl, or roti wrap, incorporating the flavors, veggies, and proteins you select. They also sell freshly made samosas. Dine in at Baingan to enjoy the colorful atmosphere and delicious northern and southern dishes any day of the week. Enjoy a vegetarian feast from appetizers to desserts by ordering cucumber salad, vegetable pakoras, malai kofta, aloo parantha, and gulab jamun. Omnivores will also find an equally extensive menu including a selection of Indochinese dishes. 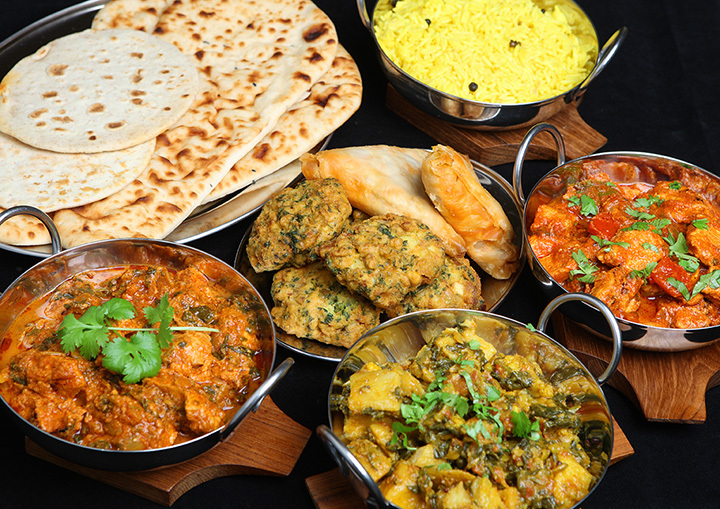 Haveli Indian offers a large selection of typical Indian dishes including vegetarian and meat options. For something lighter, the menu features several soups—coconut soup, vegetable dal, and corn soup—all calling for naan, parantha, or poori on the side. The restaurant also offers a lunch buffet that is both economical and delicious. Naatiya Indian Restaurant focuses on South Indian food with both vegetarian and meat dishes on the menu. The menu highlights are their large selection of dosas (a type of Indian crepe) that can be ordered with a variety of fillings such as masala, ghee, cheese, and chicken tikka. Naatiya Indian Restaurant also offers a lunch buffet each day of the week. Cumin India uses family recipes to craft delicious Indian cuisine, which you can enjoy eating in or dining out. Daily specialties on the menu include chicken pakora, vegetable pakoras, and vegetable samosas. For a taster option, the mixed vegetarian platter is a great shareable option allowing diners to taste the numerous hot vegetarian appetizers. Entrees on the menu include a selection of kebabs, Indochinese, Biryani, and sauced specials.